There are many types of animals that are indigenous to Lakeland. Among those include the nuisance wildlife that we are able to legally trap: bats, rats, raccoons, possums, armadillos, skunks, snakes, squirrels, birds (geese, ducks, pigeons), moles, bees, and other stinging insects like wasps. We take pride in handling animal control issues in Lakeland with professionalism and understanding that other trapping and removal companies can't match. It's very easy to forget about customer service when you are wrist-deep in animal feces! Rest assured, our techs can handle anything and will do with a smile and service you won't find anywhere else. Noises coming from the attic space are a clear indicator of the presence of nuisance wildlife. As we've said before on this site, wildlife are attracted to the space because it provides shelter from elements, a place to hid from predators, and usually has a temperature and light-level suitable for them. Take the common brown bat for an example: attic space provides the ultimate in comfort for these nocturnal creatures. Bats are actually quite small creatures when they fold in their wings, so they can wedge themselves into attic vents and between cracks in fascia board and soffit where predators can't follow. Once they're inside, they can enjoy dim lighting during the daylight hours, and are able to hang from trusses or beams to sleep. 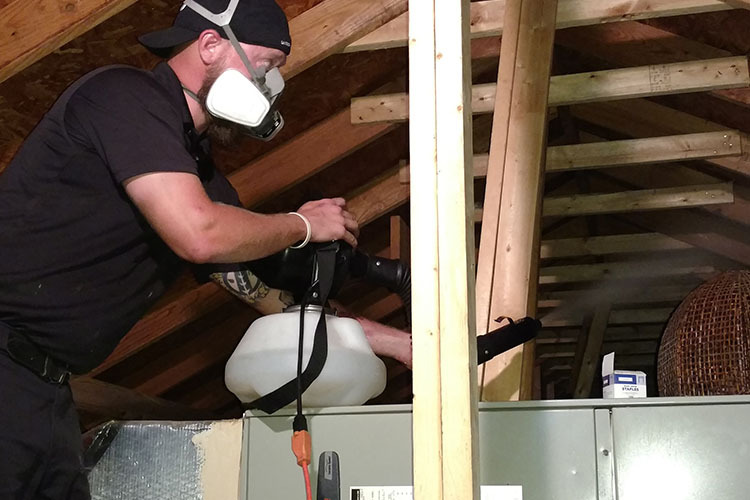 The temperature inside the attic will be warm enough for them year-round, and there is plenty of room for them to start a colony and begin breeding during the months of May through August. Which is when most of our Bat Removal calls come in. Getting rid of animals in the attic is very important for those living in Lakeland and the surrounding areas. Because most of the homes in suburban areas are so closely placed together, you and your neighbors will have a big problem in only a little bit of time if you don't take care of it ASAP. Many animals, such as rodents, travel in large numbers making Rodent Control difficult if left untreated for a length of time. While animals like raccoons do not live in large packs, a group of two or three raccoons will travel from yard to yard, eating is fill of whatever food it can find, and sleeping wherever it can. They are commonly found making a nest in the attic space, but may take naps outside under porches, behind sheds, and other dark places during the day. If you have any kind of wildlife in your attic, it will probably have made itself at home in your yard, too. Possums and bats don't usually damage the yard space, but these kinds of animals, if inside your attic, will probably be leaving droppings in the yard. These droppings are highly dangerous and you'll want to make sure that pets and small children do not go investigating them. Though not as big of a problem as having wild animals in your home or attic space, having unwanted wildlife in the yard can cause all manner of problems for homeowners and commercial property owners alike. Armadillos, skunks, and snakes are all garden pests that can warrant a call to operators like us at Lakeland Animal Removal. Armadillo Removal is another common call that we get. Armadillos will enjoy rooting around for the bugs that are in the soil of your garden or flowerbed when they get hungry. When they want to sleep, they'll probably dig a shallow hole and uproot some of your turf, too. These little creatures also carry leprosy in North America, which you really don't want to get. 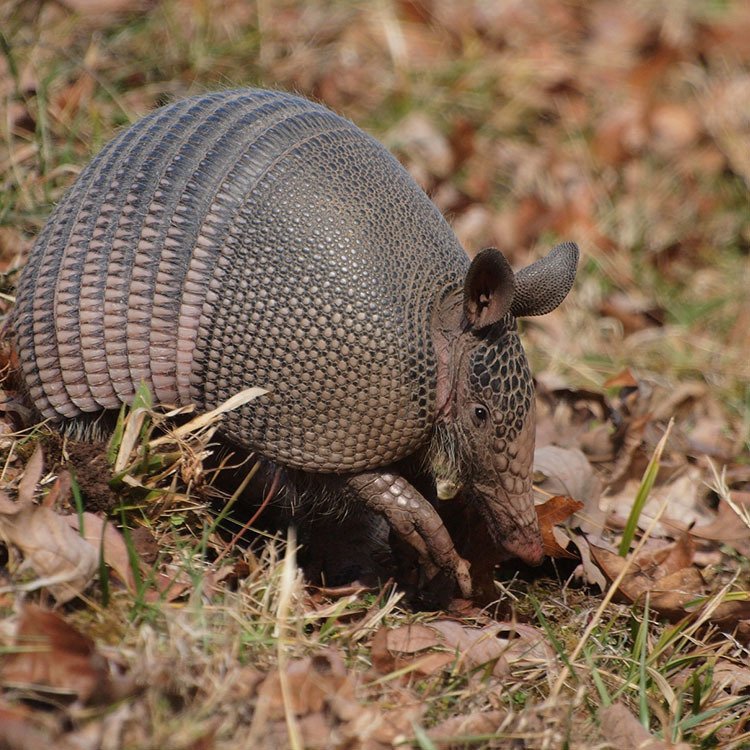 Armadillos are pretty stubborn animals and are hard to trap or scare off, so once they put down roots, they're likely to stay and enjoy the buffet in your yard. Because of people's fear of snakes, Snake Removal is one of our more common calls. There are far more non-venomous snakes in the world than venomous snakes. That is to say, the chances of a human being bitten by a poisonous snake in the back yard is pretty slim. However, that doesn't mean you should take snakes lightly. If they're in the yard and thriving, they may see the inside of your home as a great place to live and escape the elements and predators like the hawk. Snakes are also excellent swimmers and like to take a dip in above ground pools or pools without enclosures. Make sure you put the cover on your hot tub! Got animal droppings on your roof? Nine times out of ten, your roof poop belongs to a raccoon. These little creatures leave behind dark brown to black droppings the size of a small dog's waste, and it is usually full of berries, seeds, and some digested leaf material. In fact, this is one of the first signs you should call for Raccoon Removal. Most of our customers wonder why they use the roof instead of the yard, and it's simple: they're living in your attic, and use the roof as a road to get from once side of the property to another. Animal feces found in the attic can belong to any number of creatures. Our technicians determine the species from the length, coloration, and contents of the droppings. While most wildlife creatures will use the same area repeatedly to leave their droppings, some animals like bats, rats, and possums will leave urine and solid waste behind them to mark their trails. Serious diseases like histoplasmosis and leptospirosis can be contracted by contact with animal droppings and urine. This is especially true for bird droppings, making Bird Control extremely important. Stay away from it and call us immediately if you find it in your attic or other enclosed space. We often do inspections of residences and business that don't need the full-service treatment from our staff. If you are spotting animals in the yard and want to know if they are also living inside the home, we can perform an interior and exterior inspection to determine what types of services you need. Squirrel Removal is a common call we get because squirrels are able to thrive both in your backyard as well as in your attic. If your animal friends are only doing damage outside, this is a very good thing. We can help you to exclude them from any and all interior spaces, as well as make repairs, put up fencing, or apply netting or steel mesh to the exterior of the building. This will keep animals away in the future, and is called exclusion. We generally do exclusion work on every job we do unless the property owner refuses the service.